HIDALGO — Late in the fourth quarter, as the RGV Vipers’ substantial lead evaporated and the Austin Spurs got within four, Houston Rockets assignment player Zhou Qi entered the game and helped the home team mount a 14-6 run during the next five minutes to pull away and earn a 109-98 victory on Saturday at State Farm Arena. 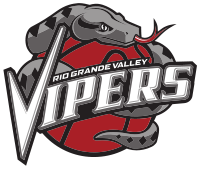 The Vipers exacted some revenge, claiming their first victory of the year over the Spurs. RGV, with some roster help from the Houston Rockets and R.J. Hunter back in the lineup, improved to 22-17 with 11 games left. The Vipers would be fifth seed in the Western Conference if the G League playoffs started today. The game was mostly positive for the Vipers, who often extended their lead to double digits. But the Spurs never went away. Austin’s fourth-quarter surge — after going down by 13 at the end of the third quarter — got the team close before Zhou came back into game with five minutes remaining. The 7-foot-1 Zhou helped RGV put an exclamation mark on the game when he hit a long jumper to make the score 107-98, then went back on defense, blocked a shot and took possession of the ball. That ended the Spurs chances with 1:03 left and allowed the Vipers to seal the contest. Zhou didn’t dominate the game, but he had a double-double with 11 points, 11 rebounds and four blocked shots. Eleven Vipers scored, and five were in double figures. Center Chinanu Onuaku had 15 points and 13 rebounds. Center Isaiah Hartenstein made 6 of 9 field goals for 13 points and hauled in eight rebounds off the bench. Markel Brown, who flew in from Houston on Saturday afternoon, led the Vipers with 16 points in 28 minutes. Hunter scored eight after missing RGV’s game Friday due to tendinitis in his knee. Tony Wroten added 12 points in 20 minutes, and he said the team was very happy to beat a quality club like Austin. The Vipers started the game hot and scored 31 points in the opening quarter. Despite 11 turnovers and many missed opportunities, RGV took a 55-54 advantage into the half. The third quarter was when the Vipers really put clamps on the Spurs and turned defensive stops into points. RGV went on a 17-4 run to close out the third quarter, led by Hunter’s hot shooting and Brown and Kyle Davis’s active defense. The surge gave the Vipers the insurmountable lead.